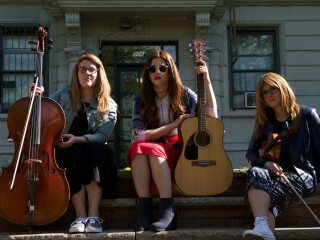 Perl is an indie rock band created by Bulletproof Stockings lead singer and songwriter Perl Wolfe, featuring cellist Elisheva Maister, violinist Dana Pestun and drummer Gloribel Castro. Formed in the spring of 2016, Perl’s sound has been compared to Fiona Apple, Florence and the Machine, and The White Stripes, and is inspired by Torah and Chassidus. Perl performs for audiences of women only, looking to create a space where all women can rock out in unison. Band members describe themselves as a “Hasidic alt-rock girl band” straight out of Crown Heights, Brooklyn. This event is for women of all ages.